An Army Air Forces menu created for the Christmas of 1943. 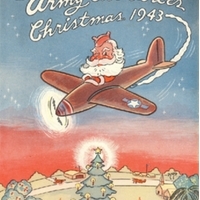 The cover shows Santa Claus piloting an airplane over an airbase. There are illustrations of a decorated Christmas tree, a palm tree and what appears to be orange trees. The interior has a Christmas note from Hume Peabody, Brigadier General of the U.S. Army who was Commanding General of the Army Air Force Tactical Center. Although Japan and China were already engaged war since 1937, September 1, 1939 is generally considered the beginning date of World War II. It was on this day that Nazi leader Adolf Hitler invaded Poland, inciting France and the United Kingdom to declare war on Germany. Through the course of the war, belligerents were general divided into two groups: the Allied Powers, consisting of the United Kingdom, France, the Soviet Union, China, Poland, Canada, Australia, India, Yugoslavia, Greece, the Netherlands, Belgium, South Africa, New Zealand, Norway, Czechoslovakia, Ethiopia, Brazil, Denmark, Luxembourg, Cuba, Mexico, the Philippines, Mongolia, and Iran; and the Axis Powers, consisting of Germany, Japan, Italy, Hingary, Romania, and Bulgaria. The United States did not join the Allies until the Japanese attack on Pearl Harbor on December 7, 1941. War was waged for several years. On May 8, 1945, Germany surrendered to Soviet and Polish troops in response to the capture of Berlin just a few days earlier, in effect ending the war in Europe. The war in the Pacific theater did not end until Japan surrended on August 15, 1945, in response to the atomic attacks on Hiroshima and Nagasaki. World War II transformed the globe's geopolitical context. The United Nations (UN) was established and the United States and Soviet Union emrged as opposing superpowers, setting the stage for the 46-year long Cold War. Much of Europe was left in economic collapse and decolonization began in Asia and Africa. Original menu, 1943: Private Collection of Thomas Cook. Digital reproduction of original menu, 1943. Guide to Orlando Air Force Base. Eugene, Oregon: University Printing, 1973. Digital reproduction available on PALMM Project, CF00001721, http://digitool.fcla.edu/R/JXDK8SAJ8CTVITQNA8UAJUD9MCMLH62C5YHH8D7CLXX5BSFA94-00764?func=results-jump-full&set_entry=000001&set_number=000431&base=GEN01. May yours be a Christmas of good cheer and may your valiant efforts in the New Year bring Victory. “Santa Claus Joins Army Air Forces, Christmas 1943.” RICHES of Central Florida accessed April 23, 2019, https://richesmi.cah.ucf.edu/omeka/items/show/1016.